Pictured left to right: Lauriel Friedman, Malka Wallick. Photo credit: Russ Rowland. It isn't until the final scene of Debra Whitfield's new play FIRE that the drama's various threads intertwine and the playwright's ultimate purpose becomes clear. However, that doesn't mean the rest of the play leading up to that point is inferior. It would be an engaging portrait of immigrant life during the Industrial Revolution, with everything that entails -- romance, family, a minimum wage that would have New Yorkers rioting today, and the ever-present American dream -- even without that superb capstone of a final scene. Directed by Benjamin Viertel, FIRE (Theatre 54 @ Shetler Studios & Theatres) is the debut production of Chatillion Stage Company, which aims to produce plays exploring the female experience. With this engaging, poignant first production, they're off to a strong start. FIRE examines the women and men connected with the fire which in 1911 claimed the lives of 146 workers on the 8th, 9th, and 10th floors of the Triangle Waist Company factory. Many of the casualties were young female immigrants working to support their families, and the play focuses primarily on three of these women and the men connected to them. 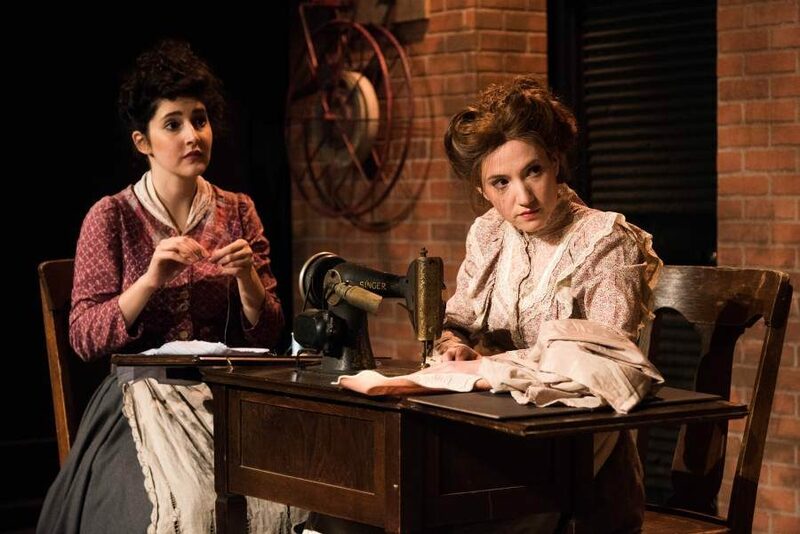 As the nature of her character's story demands, Malka Wallick turns out possibly the most engaging performance as young Russian immigrant Anna - though Lauriel Friedman also gives an especially strong performance as Italian immigrant Rosa. I could sing the praises of each cast member in turn, but I'll content myself with mentioning Stuart Zagnit, who gives a moving performance as a stubborn Jewish father alternately at odds with and supportive of his aspiring lawyer son. At first, I found the various threads at work in this drama - jumping as they do between different dates and locations - a little disorienting. But after the first few scenes, I quickly settled into the rhythm. The main narrative alternates between the four main characters: immigrant workers at the Triangle Waist Company, three women and one man. It also sometimes switches to the court case after the trial, in which the same actors who portray our four main characters take on different roles as judge, prosecuting attorney, defending attorney, and witnesses. A few times, we also see the three women modeling dresses before a group of elite socialites. This doubling up (or quadrupling up, in some cases) adds to the tightly woven nature of Whitfield's already carefully crafted structure. The final thread running through the piece is composed of a few dance segments: featuring the three main women gracefully dancing across the stage with a partner. While watching them, I assumed these dances were meant to suggest some combination of the women's heritage and their dreams for a new life in America. That may have been part of it, but after the final scene, the dance segments retroactively take on a new significance. Thanks to a talented cast and a carefully layered script, FIRE achieves a haunting transcendence for its characters. But for the audience, left to mourn the tragedy, FIRE is a searing reminder of a historical event that should never be forgotten.